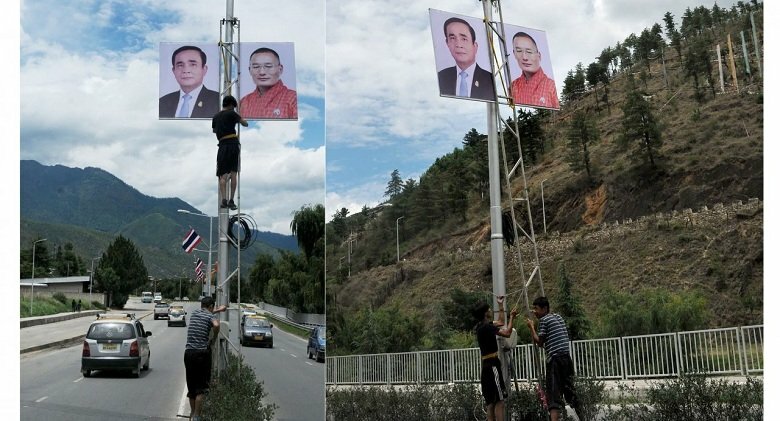 Workers install posters of Prime Minister of Bhutan Tshering Tobgay, right, and Prime Minister General Prayut Chan-o-cha and the countries’ national flags along an expressway in the capital city Thimphu, Bhutan. According to a joint press statement draft from the Cabinet on Tuesday, Prayut is expected to extend Thailand’s support to establish an eye, ear, nose and throat medical centre in Bhutan by next year as well as discuss the local agricultural marketing scheme “One Gewog One Product”, which parallels Thailand’s iconic One Tambon One Product scheme. Thailand is Bhutan’s second-top import supplier, accounting for US$24 million (Bt800 million) of Bhutan’s total imports worth $455 million. During Prayut’s two-day visit he will pay courtesy calls to King Jigme Khesar Namgyel Wangchuk and Queen Consort Jetsun Pema, have bilateral discussions with his Bhutanese counterpart Tshering Tobgay and open a new Thai honorary consulate-general in the capital of Thimphu. Thailand, one of 52 countries enjoying diplomatic relations with Bhutan, initiated ties with the South Asian country in 1989. Prayut also said on Tuesday that the visit should highlight Thailand’s strength in maintaining foreign cooperation. This month Sri Lanka and Bhutan. Next month the world: Vatican City, Monaco, Tuvalu? Getting in all the junket trips he can just in case and I said just in case he loses election His idea would see the world on the Thai Taxpayer instead of paying for it by his own money, New motto from Thai pm "up and away let's see the world"
Jacket is electric, sets his eyes off. But that is what they have to sell electricity? 46% is sold to India. Plus they are considered the less corrupt of SE Asian countries?